EFSA’s assessment came nine days after the European Commission requested a review of the controversial University of Caen study. The French study found that rats fed on a diet containing NK603 – a maize seed variety doused with Roundup weedkiller – or given water with Roundup at levels permitted in the United States, died earlier than those on a standard diet. The food agency’s initial review said the analysis contained in the study, led by biologist Gilles-Éric Séralini, was insufficient and asked for additional evidence by 12 October. “Considering that the study … has unclear study objectives and given its inadequate design, analysis and reporting, EFSA finds that it is of insufficient scientific quality for safety assessments,” it says. But EFSA's findings triggered renewed criticism that the Parma, Italy-based EU agency favours the biotech industry in its safety assessments and product approvals. Greenpeace EU agriculture policy director Marco Contiero demanded a moratorium on GM crops, adding: “The EU needs to redesign safety testing so that it routinely assesses impacts over the long term." EFSA has been under fire for years for allegedly tilting towards business interests. In February, a report by two campaign groups, the Corporate Europe Observatory and the Earth Open Source, accused the agency of repeatedly relying on industry scientists and information in risk assessments that are used by EU institutions and national governments. “Too often it’s not independent science that underlies EFSA decisions about our food safety, but industry data,” says the report ‘Conflicts on the menu’. Although the decade-old agency has defended its decisions, in March it announced moves to clarify disclosure rules and guidelines on who can serve as scientific experts to address criticism in its evaluations of products, including the safety of genetically modified crops. Agency officials described the independence policy as a prioritising and consolidation of existing guidelines rather than a major overhaul of standards. 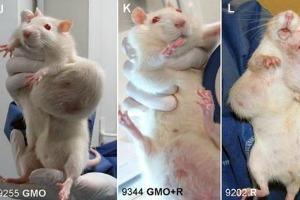 Biologist Gilles-Éric Séralini and his colleagues at the University of Caen fed their laboratory rats on a diet containing NK603 - a maize seed variety doused with Roundup weedkiller - or water with Roundup at levels permitted in the United States. The animals suffered mammary tumours, as well as severe liver and kidney damage, according to the peer-reviewed study which was published last month in the journal Food and Chemical Toxicology. The researchers said 50% of male and 70% of female rats died prematurely, compared with only 30% and 20% in the control group. Of course EU will find all the reasons in the world to counter such a study as it supports Genetically Modified Organisms. Actually, you don’t even need scientically grounded proof. This proof request is like the shale gas companies you say: Prouve that the people are sick and animals are loosing their fur because we are pumping chimicals into the groud in the area. You just need to think for a minute. The GMO have they been through the testing of thousands of years of natural “testing” through evolution? Why do you think a foundation created an atomic bunker in the North Pole for storing orignal seeds? We are taking huge risks playing with evolution, playing “God”, but the risk is worth the money isn’t it? If there is still one God on Earth, it is Monney God, we devote everything to Him. I just wish you live long enough to have a taste of the Hell you are creating. Sorry for the spelling mistakes, I wrote too quickly and did not read my text. It appears that each man will make offerings to the god they serve…and we shall ALL serve somebody-n’est pas? You are right , though leave God out of it . It is all about money , big corporations like lots of money . Monsanto likes lots of money , would like to control agriculture and the food supply the world over . Never mind GMO , you don’t want to have Monsanto set a foot in your country . At least someone challenges the original French report and its biased conclusions. Its difficult to have sensible discussion in Europe on this, as Marius clearly shows. I guess masked cretins in white bio suits trampling experimental crops about sums it up. EFSA and EUROPEAN COMISSION :”inadequate design,analysis and reporting is nothing;we need a adequate designed,analysis and reporting very soon(should be already) .Is the reason we are paying YOU, and the job You have to be done. We are actually selling our health for profit, isn’t it wonderfull?